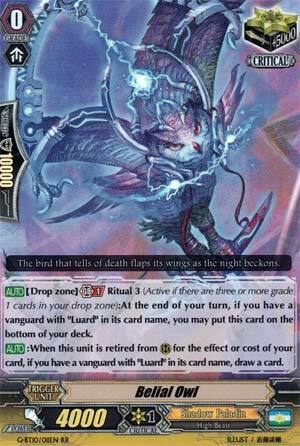 [AUTO](Drop Zone) Generation Break 1 Ritual 3 (Active if there are three or more grade 1 cards in your drop zone):At the end of your turn, if you have a vanguard with "Luard" in its card name, you may put this card on the bottom of your deck. [AUTO]:When this unit is retired from (RC) for the effect or cost of your card, if you have a vanguard with "Luard" in its card name, draw a card. And then next week we can start on the reasonably new things. For now, I should probably speed through all of the stuff that actually matters so that there's energy left. Luard staple that costs too much money than is reasonably healthy.